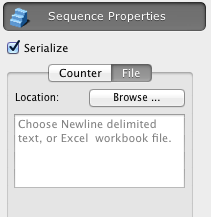 Use the File tab of the Sequential Properties section of the Object Information Panel for setting a text file as a source of the sequential barcode data for a selected barcode object. Browse button: Clicking on this button invokes the Open File panel to navigate to the line feed separated file that contains the sequential barcode data. This file should be in plain text format, and have the .txt extension. Please NOTE that QR Codes require TWO line feeds between barcode data blocks, because the single line feed can be encoded into the QRCode. 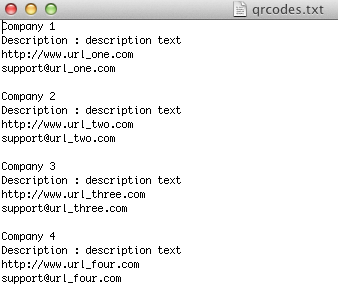 Different barcodes on a page can use different text files. 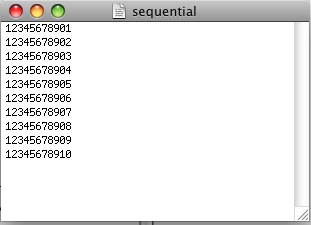 If the count of data strings for a selected barcode object is less then the total number of the labels to be printed, the rest of the labels will not contain the barcode.